You’ve located an article on the “Articles & more” section of the library catalog or from a library database that you want to use for your paper. But how do you get the full text of the article? When you click (the Find It button), you are taken to the 360Link page. This page allows you to access the article you found. 1. Click “Article” to get the full text of the article. 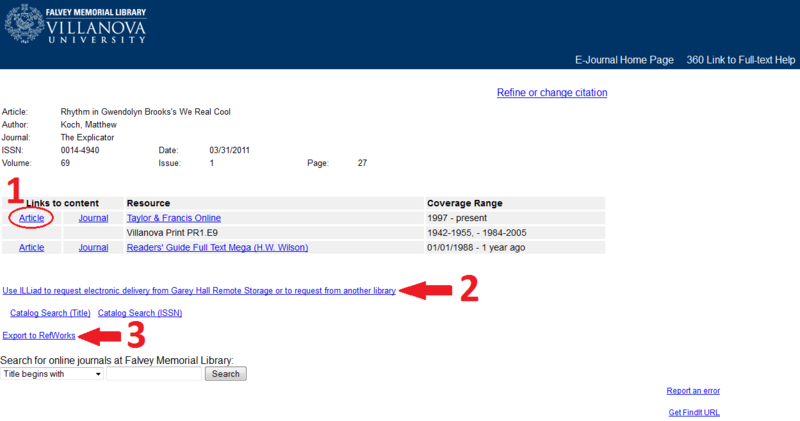 You can also click “Journal” to browse the contents of the specific journal the article was published in. Or click the name of the database to browse or search that specific database. 2. If the full text of an article is not available, you can click a link to request it through Interlibrary Loan (ILL), also called ILLiad. Note that the Catalog link on the 360Link page will take you to the library catalog if Falvey has a print subscription to the journal you want. Disclaimer! This article touches on the highlights of the 360Link page. If you have further questions, or are having trouble accessing articles, please contact us via email or call (610) 519-4270.